The Emory community recycled a total of 245,102 pounds of material across campus in November 2017, 58,749 more pounds than November 2016. The Emory community recycled a total of 245,102 pounds of material across campus in November 2017, 58,749 more pounds than November 2016, that will be diverted from the landfill. 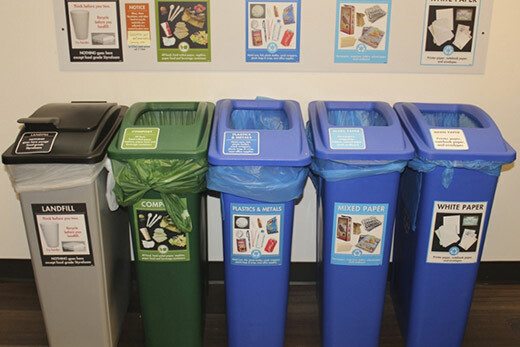 “As we enact the new waste policy to pursue our goal to divert 95 percent of our waste from the landfill, it is exciting and encouraging to measurably see members of the Emory community keeping more materials out of our landfills every year,” says Ciannat Howett, director of the Office of Sustainability Initiatives. The November Recycling Competition was an exciting event. The 2017 winner for total recycled material was Whitehead Biomedical Research Building with 13,821 pounds of recycled material collected from the building, an increase from only 1,000 pounds of recycling last year. 1762 Clifton Road and Harris Hall/Complex were runners-up, diverting 8,170 and 6,043 pounds respectively. Emory’s efforts regarding landfill diversion do not stop with its campus boundaries. On Nov. 15, Emory partnered with the Centers for Disease Control and Prevention and Emory Point to collect household items, paints, light bulbs, commonly recycled materials, electronics and paper for shredding. During this event, nearly 11,300 pounds of common recyclables were collected, in addition to 7,144 pounds of electronic waste and nearly 5,000 pounds of hard-to-recycle materials. The partners plan to host another event in April in celebration of Earth Month.